Spring is coming and with it the promise of warmer weather that will allow you to head up to your cabin. Already, you’re looking forward to the rest and relaxation. However, it may be that your cabin is still “in the works” so to speak, leaving you with decisions yet to be made. Not the least of which is how to set up your home’s kitchen, from cabinets to flooring to the size of the refrigerator you should get. And you’re also wondering what kind of countertop you should choose. Now, “cabin” could mean different things to different people. What kind of cabin you’re looking to create and what you intend to use it for could be factors when it comes to picking your countertop. Is it a rustic hunting cabin you have in mind—really just a bare-bones kind of place? Or are you looking to create an elegant interior with a “cabin feel” but all the comforts of home? There are actually quite a few options to choose from. Of course, there is natural stone (think marble, granite, quartzite, and soapstone). There’s quartz, too. Then there are options like wood counters, stainless steel ones, cork, and laminate. Plus, you can even get countertops made of recycled material. 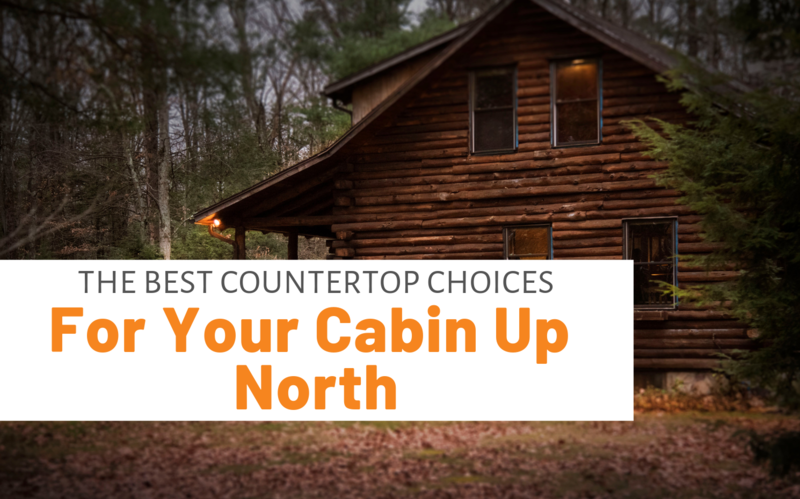 Well, let’s start out by saying that there isn’t necessarily one “right” option for your cabin’s countertops. It’s going to be up to you, and there could be multiple factors that go into it, including your budget, your cabin’s use, and your personal preferences. But let’s have some fun with different cabin scenarios and countertop options you could choose for them. First, though, let’s take a minute to look at factors that could be in play and questions you could ask yourself as you make this decision. What kind of cabin are you going for? What will you be doing in the kitchen? Next up, the function of your kitchen. Ask yourself what you plan to do here. Is it going to be a place for cooking four-course dinners and chatting with friends while doing so? Alternatively, maybe it’s just a spot for light cooking (after all, the only things you know how to make are scrambled eggs and chili). Or maybe you don’t need it to be much of a “workspace” at all since you plan primarily to open cans and microwave premade meals. Furthermore, you could be gunning for a very durable countertop for one primary reason. In your hunting cabin, you want to be able to butcher what you take down. On the other hand, maybe you want the kitchen counter to double as space for something else? A place for artwork to dry perhaps, if your cabin is your creative getaway. Now, without any more ado, let’s do a whirlwind tour of our five cabins up north. This is the cabin that calls for attractiveness and durability. You want it to be tough because you actually plan to use it for tough stuff. Still, you want it to look nice, too. And the kitchen is no exception, so how about concrete countertops? Tough enough to butcher your trophy on! You already have a cabin made of wood and it’s in the woods. So, how about adding a bit more wood to the mix with wood countertops? However, you may want to be careful what kind of cabinets and other kitchen elements you pair it with so that your cabin doesn’t look “over-wooded.” On the other hand, if having your cabin be an expanse of warm-looking cut trees is what appeals to you, then go right ahead and incorporate as much of the material as possible! Let’s say you’re looking to bring a little of the bustle of Motor City with you when you head out of Detroit for a weekend in the woods. Why not tap into the industrial look with stainless steel for your countertops? While it may be all woods and wilds outside your cabin, you don’t have to “rough it” inside during your cabin stay. Plan for a gorgeous, modern interior with up-to-date and sophisticated amenities. Marble, while it may not be the most durable of all your countertop options, could fit the bill here. You just need a place with the basics to keep you relaxed and comfortable. It doesn’t need to look fancy, just be homey and pleasant. Plus, you’d like to stay at or under budget (and did we mention it isn’t a very large budget?) Then, maybe it’s time to consider laminate countertop in a color and design that appeals to you. Which one is “best” for your cabin? That may depend on what your cabin is for and also on what you’re looking for. What one cabin dweller may love for its durability and functionality, another may scorn for its perceived ugliness. So make a decision tailored to your own situation. Once you’ve decided which type of kitchen counter (or even bathroom counter) is right for you, don’t forget to take proper care of it. After it’s installed, be sure you stay up to date with sealing your countertop if needed. Plus, remember to keep it clean—not just in a bid to avoid staining but also so you can enjoy a tidy kitchen.